KABUL, Afghanistan - A massive explosion rocked a highly secure diplomatic area of Kabul Wednesday morning, causing casualties and sending a huge plume of smoke over the Afghan capital. It was one of the worst attacks Kabul has seen since the drawdown of foreign forces at the end of 2014, CBS News correspondent Debora Patta reports. The attack has raised new fears about the government's ability to protect its citizens nearly 16 years into a war with insurgents. The bomber drove into Kabul's heavily guarded diplomatic quarter during the morning rush hour, leaving behind a bloody scene of chaos and destruction. The explosives were hidden in a tanker truck used to clean out septic systems, said Najib Danish, deputy spokesman for the interior minister. The blast gouged a crater about 15 feet deep near Zanbaq Square in the Wazir Akbar Khan district, where foreign embassies are protected by a battery of their own security personnel as well as Afghan police and National Security Forces. 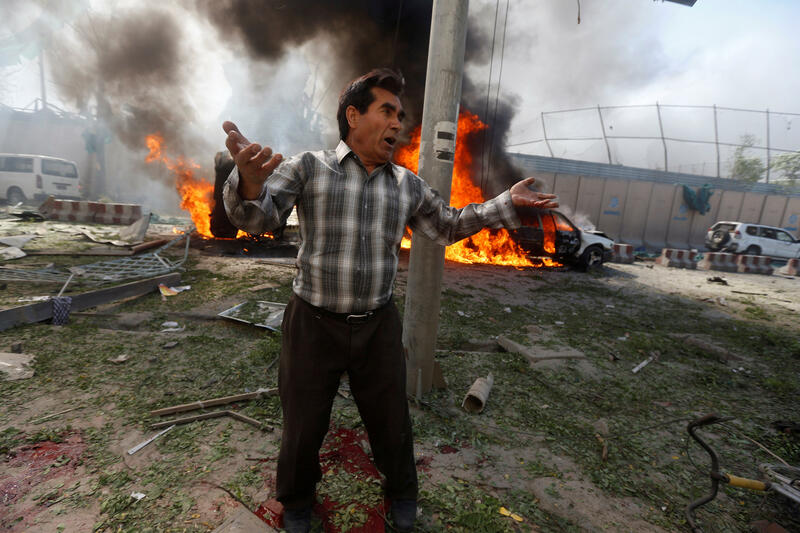 Afghanistan's government media center said the attack left 90 dead and at least 400 wounded. Most of the casualties were reportedly civilians, including women and children. A U.S. State Department official has confirmed 11 American contractors sustained non-life threatening injuries in the attack. The U.S.-led NATO coalition, Operation Resolute Support, said in a statement that the bombing happened near its headquarters and the German Embassy. It said, "Afghan security forces prevented the VBIED from gaining entry to the Green Zone, but the explosion caused civilian casualties in the vicinity." "The attack demonstrates a complete disregard for civilians and reveals the barbaric nature of the enemy faced by the Afghan people," the statement continued. "It also highlights the hypocrisy of the enemy who claim that they only target Afghan Security Forces and Foreign forces, yet continue to cause death and suffering amongst innocent Afghans." The German Foreign Ministry said German embassy workers were wounded in the blast, and that an Afghan security official who had been protecting the building was killed. The Taliban on Wednesday denied involvement in the bombing. Both the Taliban and the Islamic State of Iraq and Syria (ISIS) have staged large-scale attacks in the Afghan capital in the past. The explosion occurred at the peak of Kabul's rush hour when roads are packed with worktime commuters, Patta reports. The U.S. Embassy in Kabul warned American citizens to avoid the area of the blast and cancelled all its appointments for routine American Citizen Services for the day. Afghanistan president Ashraf Ghani's office condemned the "cowardly attack in the holy Month of Ramadan targeting innocent civilians in their daily life," while the U.S. Embassy Kabul Special Charge d'Affaires Hugo Llorens said, "This horrific and shameful attack demonstrates these terrorists' complete disregard for human life and their nihilistic opposition to the dream of a peaceful future for Afghanistan. The terrorists, and those who provide them support in any form, deserve the utter scorn of all civilized people around the world." The Green Zone neighborhood is considered Kabul's safest area, with foreign embassies, press bureaus, and government offices protected by dozens of 10-foot-high blast walls and guarded by police and national security forces. The BBC said that one of their staff, driver Mohammed Nazir, had been killed in the attack and that four BBC journalists had been injured. "This is a devastating loss to the BBC and to Mohammed Nazir's friends and family," the BBC's statement read. Jessica Donati, a reporter for the Wall Street Journal who was at the paper's bureau in the Green Zone at the time of the blast, told CBS News that she "found everything, all the glass shattered. I came down to check on the staff and our staff were all terrified... The phone lines were down." Afghan TV news channel, Tolo TV, said one of their journalists was killed in the explosion. Najib Danish, deputy spokesperson for the Interior Ministry, said the blast was so heavy more than 50 vehicles were either destroyed or damaged at the site of the attack. "We don't know at this moment what was the target of the attack, but most of the casualties are civilians," said Danish. Windows were shattered in shops, restaurants and other buildings up to a half mile from the blast site.